Fantasy Points Above Expectation (FPAE) is a metric we created to better capture how much fantasy production each team is giving up. FPAE measures how many fantasy points a team gives up to a certain position, relative to what they were expected to give up. For example, Miami’s FPAE against QBs in 2016 was 6.1, meaning that they gave up an average of 6.1 points more than expected to QBs. In this context, “expected” is referring to their opponents’ average fantasy points. As a further example, let’s say Sam Bradford is averaging 15 fantasy points going into a Week 6 game against Detroit, and he scores 22 points in that game. Detroit would get a +7 FPAE vs. QBs for Week 6, since Bradford scored 7 points more than his average. 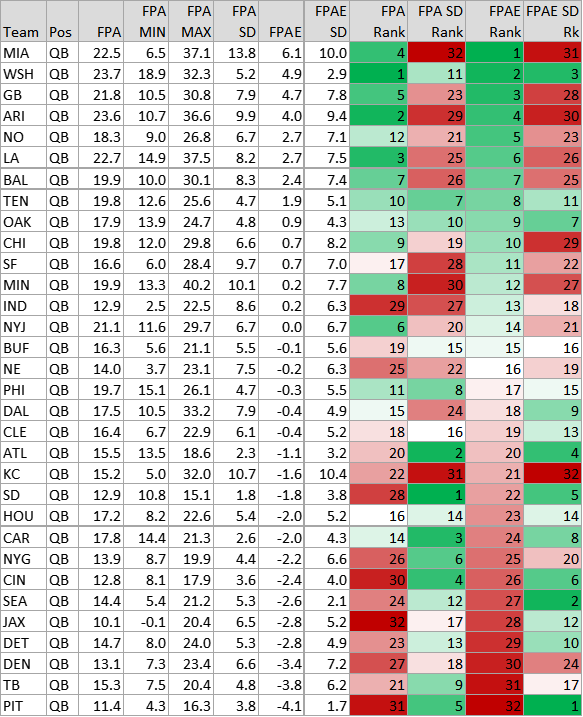 Detroit’s +7 FPAE for Week 6 would be combined with their QB FPAE values from Weeks 1-5 to get their average QB FPAE. This process is repeated for each team against each position to calculate our FPAE values. 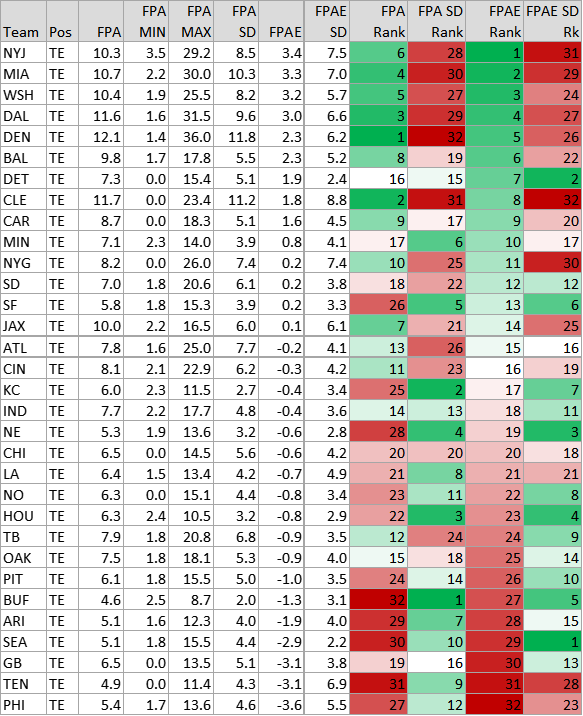 Negative FPAE values indicate that a team is holding players they face below their average production. What’s the point of doing this? Well, should teams be penalized equally for giving up 40 fantasy points to Julio Jones vs. giving up 40 to Cordarrelle Patterson? Probably not. What about holding Le’Veon Bell to 5 fantasy points vs. holding Matt Asiata to 5 fantasy points? Definitely not. FPAE accounts for both who scored against a team and how much they scored. 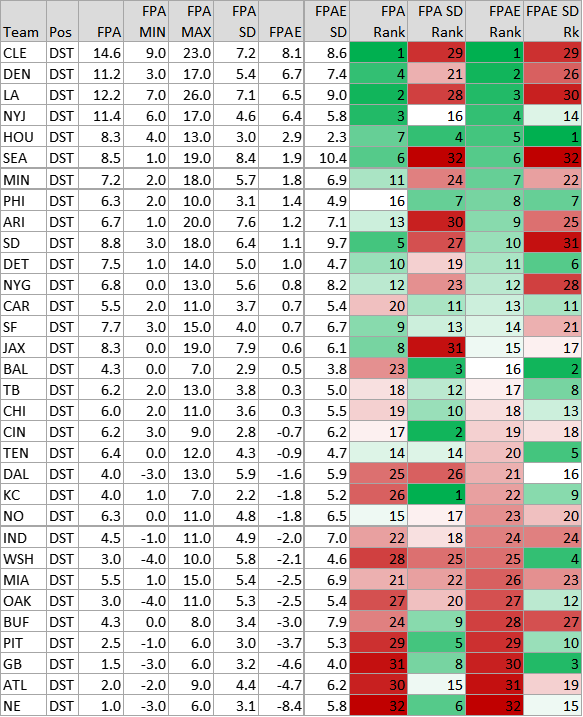 In addition to FPAE scores, we also provide raw Fantasy Points Against (FPA) as well as standard deviations (SD), which capture the variation in points against. Small standard deviations (e.g. 2 points) indicate that a team has been very consistent in the amount of points they give up, whereas high standard deviations (e.g. 10 points) indicate that a team has been more sporadic. As an example of how the SD can be used, Washington and Green Bay both have an FPAE against QBs of about 5. 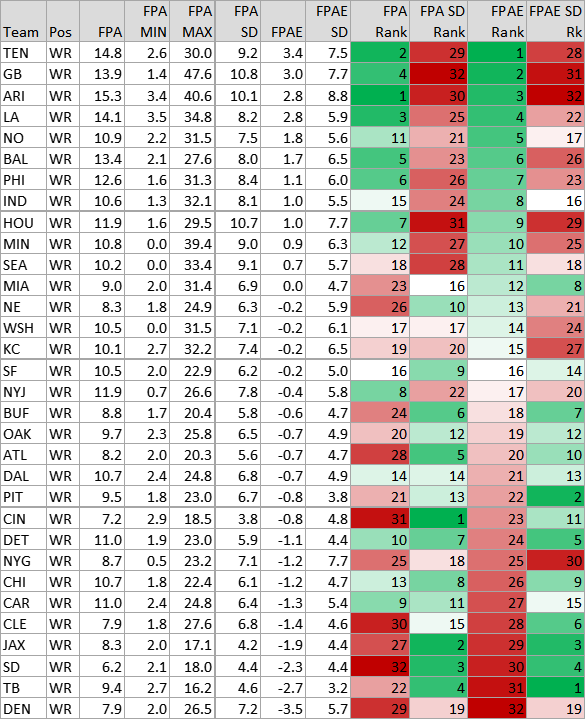 However, Washington has an FPAE SD of 2.9 points compared to Green Bay’s SD of 7.8 points. This tells us that, while both teams have been giving up points in bunches to opposing QBs, Washington has been doing so much more consistently, whereas Green Bay’s QB FPAE has been more up-and-down. So, if I have a choice between starting a QB against Green Bay or Washington, Washington is the safer bet to give up a big performance. 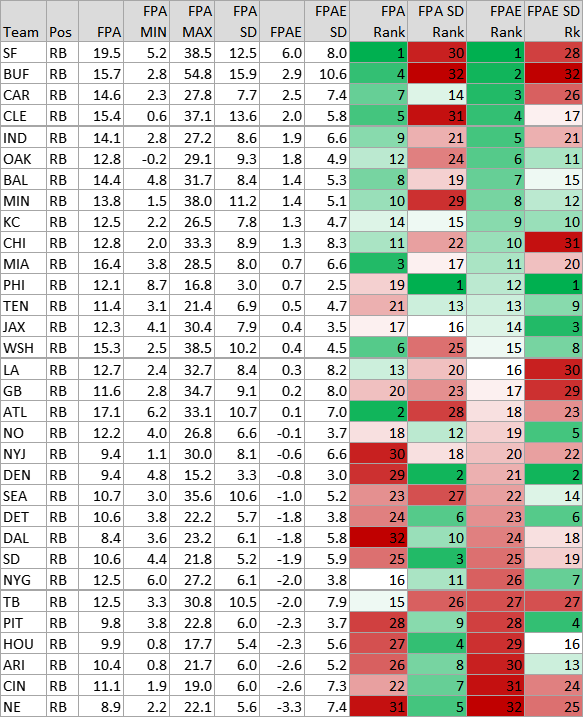 The tables below display each team’s metrics against the QB, RB, WR, TE, and DST positions in 2016 (figures are based on Weeks 11-16, PPR scoring). Each week of the 2017 NFL season, we will provide updated FPAE values by position, similar to the tables below, as a tool for all things Fantasy Football.